UNCASVILLE, Conn — The Canton Warriors made the most of their second chance Saturday. 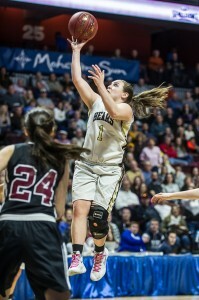 Senior Margaret Treacy had a game-high 25 points with two steals as Canton beat defending Class S champion Thomaston, 64-51, for the program’s first state championship in a rematch of last year’s final. Junior Emily Briggs had 18 points and nine rebounds for the third-seeded Warriors (21-6), which lost to the Bears in last year’s final (52-50). “That makes it a million times better,” Treacy smiled. Junior Abigail Skinner added 13 points and 10 rebounds for Canton. Junior Casey Carangelo had 10 points and 13 rebounds and classmate Julia Quinn scored 17 for the top-seeded Golden Bears (26-1). Senior Gabrielle Hurlbert added 10 points for the Berkshire League champions. Thomaston was playing in its fourth straight Class S final and had won the previous two. “Our seniors have been amazing,” Golden Bears coach Bob McMahon said about the team’s four-year run. “The saddest part is not losing this game. The saddest part today is it’s the last time they (the seniors) put the uni on. They just addressed their teammates like mature, young women. I’m just proud of everything they’ve ever done. Canton opened the second half with an 8-2 to run to slowly pull away from Thomaston. Treacy started it with a jumper, followed by a three-point play by senior Emma Charron and Skinner’s 3-pointer, to give the Warriors a 30-21 lead with six minutes, 22 seconds left in the third quarter. Canton put the game away at the foul line in the fourth quarter. Briggs starting it with four straight free throws to extend her team’s lead to 46-33 with over six minutes left in the game. The Warriors made 16 of 24 free throws in the fourth quarter. Thompson attempted 18 free throws the entire game.